Newest issues... Endstop working, only problem, I have both my X and Y setup as normally closed switch at high end. If I test, and manually press, they both work. However when I home Y-Axis perfect moves to the switch (+ side) and stops, if I home the X-Axis it moves to the wrong side (- side)... unsure what I did this time. My Z is a BLTouch, but I will not worry about that until X-Y are homing correctly. Did you try changing the M569 settings for the X motor? Where on the bed have you chosen X=0 Y=0, and which directions are +X and +Y? Where are the endstop switches located? 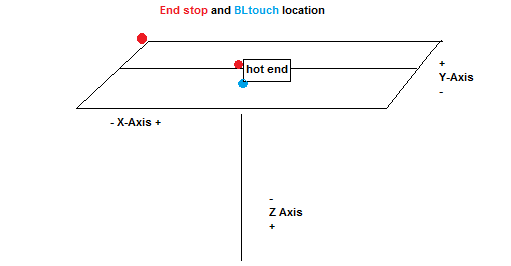 On the image below my endstop are in red, the Z-probe BLTouch in blue. Now, when homing the X-Axis works perfectly well, but when move the Y axis, instead of moving toward the +, it moves to the -. When I played with the M569, the homing on the hotend axis always worked, but never the other axis. Edit: I am sorry, I realized that I haven't copied all the modification that I had to apply to my endstop when I changed the M569. OK, so X) Y0 is at the front left, +X is to the right and +Y is to the back. You have a low end (min) X endstop switch and a high end (max) Y endstop switch. 1. Declare it as a high end switch (Y2) in the M574 command. You have already done this. However, if the X endstop is at the left, it is a low end switch and you need X1 in the M574 command, not X2. 2. In your homey.g file and the Y homing section of homeall.g, you need to move the Y axis in the +Y direction. It sounds to me that you are moving it in the -Y direction, sway from the endstop switch. See https://duet3d.com/wiki/Configuring_RepRapFirmware_for_a_Cartesian_printer#Homing_X_and_Y and then https://duet3d.com/wiki/Configuring_RepRapFirmware_for_a_CoreXY_printer#homeall.g_file. Note that the illustration for CoreXY assumes both switches are low end, so with your high-end Y endstop switch you will need to reverse the sign of the Y parameter in all the G1 commands. Will modify the Honey.g and Homeall.g tonight. I wonder what would honey.g would do ? For printing, what would be the optimal position for the X=0, Y=0, Z=0? ATM mine is front to the left... I am wandering if I should move it to the back... logically, due to the lever effect, the closest to the ballscrew my print will be the less force would be on the bed, no? My setup is the same, and I had to figure all that out two nights ago. I think I will be moving my Y limit to the other end once I have printing abilities. I see no reason to have one high and one low. It's just how the design I chose did it. I seem to be the first one building this particular design. The designer has not actually completed his build. For printing, it really doesn't matter where "Home" is. It's just a reference point. If you want your prints to be orientated closer to the balls screw, then just orient them that way on the build plate of you slicer. AFAIK most slicers will default to putting the object in the centre of the bed (regardless of where XY home is). If you are worried that the bed droops away from the screws, then homing Z in the centre of bed will make the best of a bad situation.